1. Tell us about your background and how did you become the director for 2016 Fine Art Asia? A professional dealer with more than 25 years of experience in the appraisal and conservation of classical Chinese furniture. The second generation of the prominent H.L. Hei family, which has been dealing in huanghuali and zitan furniture from the Ming and Qing dynasties for over half a century. “Andy Hei Ltd.” was established by Andy in 1999, specialising in Chinese antique furniture and works of art. 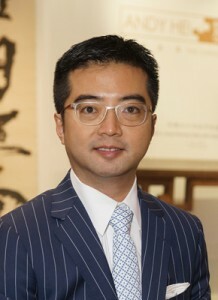 With a firm belief in Hong Kong as the hub of the art world in Asia, and following his own experience of participating in art fairs in London and New York for many years, in 2006 he initiated and organized the first annual Hong Kong International Asian Antiques and Arts Fair, which was renamed Fine Art Asia in 2010. 2. Who are the visitors to the fair Fine Art Asia Fair? A sophisticated, appreciative audience of dealers, collectors, curators and art lovers from throughout Asia as well as from all over the world. Stable proportion of visitors from China, Hong Kong and Taiwan. The number of visitors from Southeast Asia, such as Singapore, Indonesia and Malaysia has been increasing since 2013. 3. Tell us more about this year’s art fair. What’s new? For the first time, 12th edition of Fine Art Asia will open its doors to photography. The largest antiques and modern art fair in Asia will inaugurate a new section dedicated to the 6th art. This space will bring together a selection of Hong Kong and foreign galleries chosen by the Boogie Woogie Photography agency for the quality of the proposed works. Visitors will notably have the privilege to view a rare display of remarkable vintage prints by the Japanese artist Araki Nobuyoshi, presented by Zen Foto Gallery, including "Fashionable Woman" (1980) and "Love Song of a Woman's Journey" (1981); the work of award winning Taiwanese photographer Chou Ching-Hui, presented by Hong Kong based La Galerie; “i Eye 愛”, an iPhone photo series exhibited by Alan Chan; and also one of the most prominent Chinese living artists, Liu Bolin with his best-known project “Hiding in the City” series, presented by Hadrien de Montferrand Gallery. Boogie Woogie Photography will also showcase three Hong Kong photographers, all inspired by nature: Elaine Liu, John Fung and Stephen King. 4. What's your favourite piece from this upcoming exhibition? This work depicts a noble woman, instead of more usual portraits of Government officers, reflecting the growth of the painting market at that time. 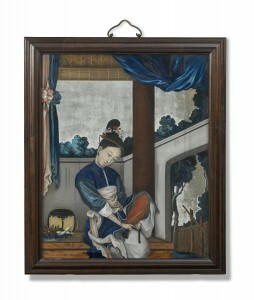 The painting is framed in zitan, a hardwood with high artistic and material value. Joseph’s coat of many colours has inspired countless creative ventures from songs and the works of 16th century artist Velazquez to the modern musical. 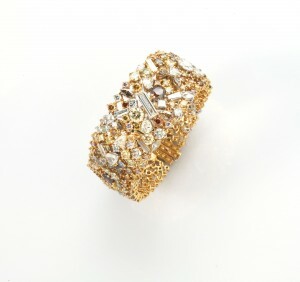 A patchwork of 313 fancy-coloured, white and golden rose cut diamonds in differing sizes and shapes set in 18-carat yellow gold, this magnificent bracelet is inspired by the most famous biblical garment of all time. Rossi & Rossi has participated in the fair every year since its inception in 2006. And the exhibitor keeps surprising us every year. This bronze sculpture of Vajrasattva Shakti from the School of Zanabazar in Mongolia, dating from the late 17th to early 18th century, is one of the masterpieces of Rossi & Rossi’s exhibition at Fine Art Asia 2016. 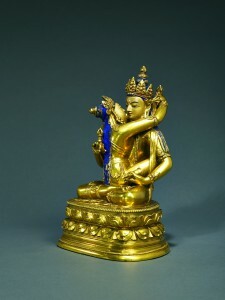 Usually Vajrasattva was depicted as a single figure, making this image rare. Zanabazar (1635-1723) was a highly significant Asian artist who distinguished himself in a range of disciplines, similar to the great Renaissance masters Leonardo da Vinci and Michelangelo. 5. What advice would you give to the new or young collectors who are entering this market? Love at first sight is real. Believe in the first impression the art piece gives you. And then conduct researches and ask questions, that’s why we encourage people to walk into the galleries and to visit art fairs, because this is crucial to talk to the dealers or artists directly. 6. How has the art market changed since you started? The European and USA art market began to decline after the 911 accident happened, which China market showed a rising state. In 2006, there were only 17 exhibitors in the first edition. At first the antique industry did not show a very enthusiastic attitude; however, the exhibitors began to show their interests and were so passionate in being part of the fair after a certain while. 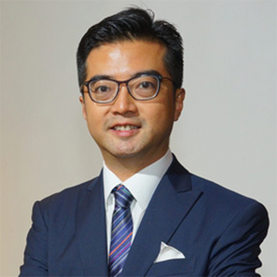 This explains organising an art fair which combines art & antiques in Hong Kong has brought up a very fresh idea, and it opens innovative ways and opportunities for the antique industry. 7. How do you see Hong Kong in the international art scene? 8. What do you think about Barnebys, who brings all the art objects on a single platform? Like every cross-collecting fairs for arts, Fine Art Asia aims to present a wide array of high quality collectibles to the International art lovers and visitors. We put together antiques, Impressionist, modern art & contemporary arts, Fine Art Jewelry & timepieces, Chinese Ink paintings, Design & decorative, as well as the latest category, Photography this year. Therefore, we are happy to see a new and vibrant platform like Barneby’s that shares the same concept with us, to promote cross-category collecting. And I am delighted to see our friends and partners from around the world had beautiful exposures on it, too.